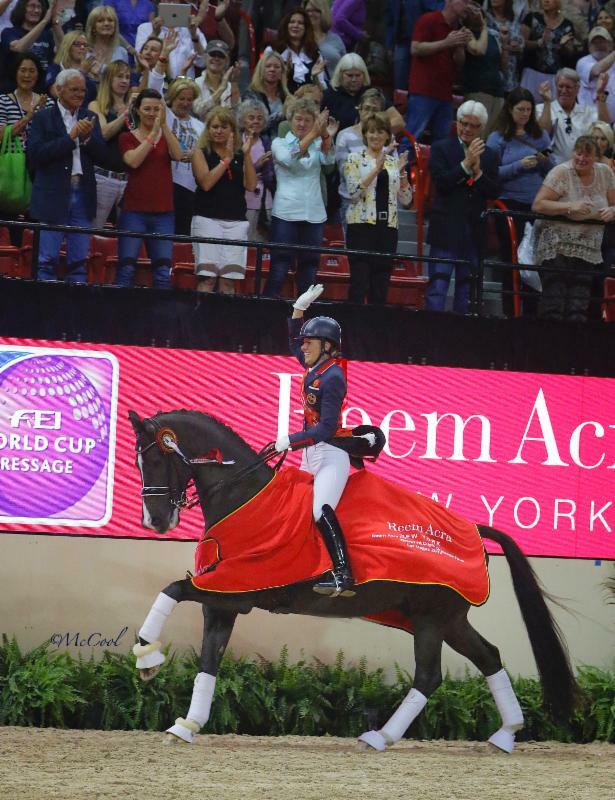 The atmosphere at the Thomas & Mack Center was electric as eighteen of the world’s best horses and riders took to the arena Saturday to compete in the FEI World Cup™ Grand Prix Freestyle, the concluding competition of the 2015 Reem Acra FEI World CupTM Dressage Final. 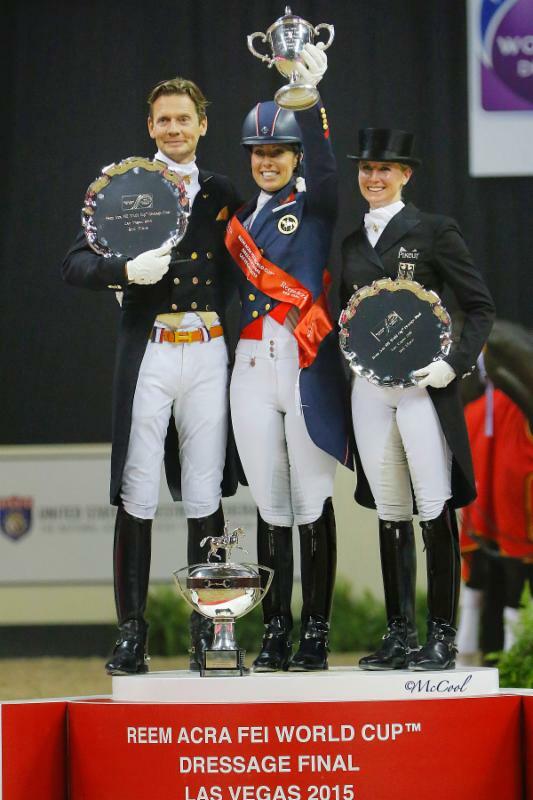 Last year’s winner, Charlotte Dujardin of Great Britain and her wonder horse Valegrosuccessfully defended their title, scoring a 94.196% for their performance to clinch the win. 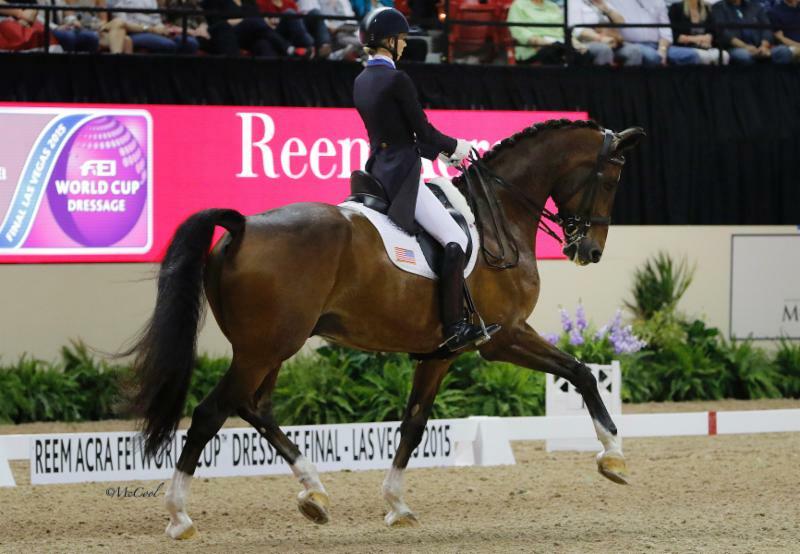 This is the first time that the FEI World Cup™ Finals have been held in the U.S. since 2009, and the fourth time that Las Vegas as hosted the Final for dressage. 10,920 enthusiastic spectators filled the stadium to watch Saturday’s star-studded Final, with many clapping along to the music of the performances. Former World Champion Edward Gal of the Netherlands, the FEI World Cup™ Champion in 2010, took second place aboard Glock’s Undercover N.O.P. 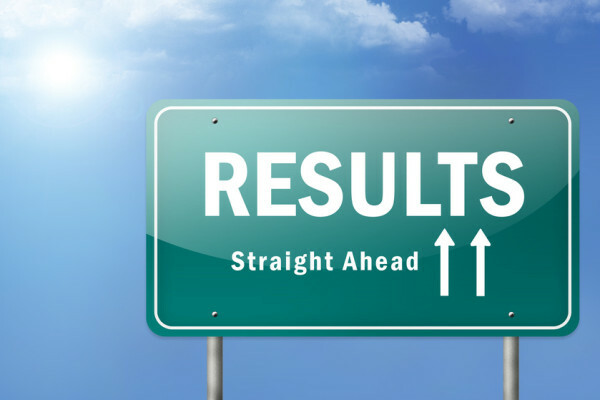 after a super performance, scoring 84.696%. 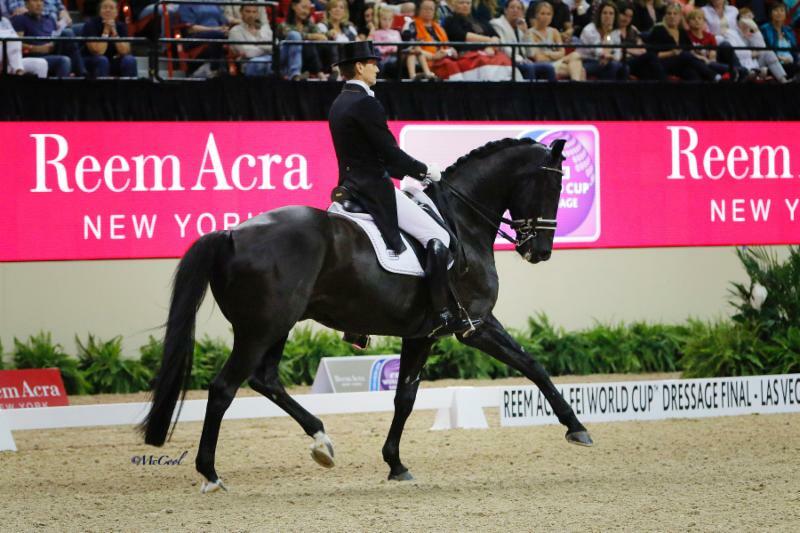 This is Gal’s ninth FEI World Cup™ Final appearance, and his third aboard the 14 year-old gelding Glock’s Undercover, whom Gal competed at the 2012 London Olympic Games. 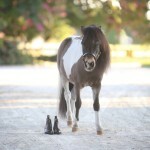 The pair also took the runner-up spot in Thursday’s FEI Grand Prix competition. 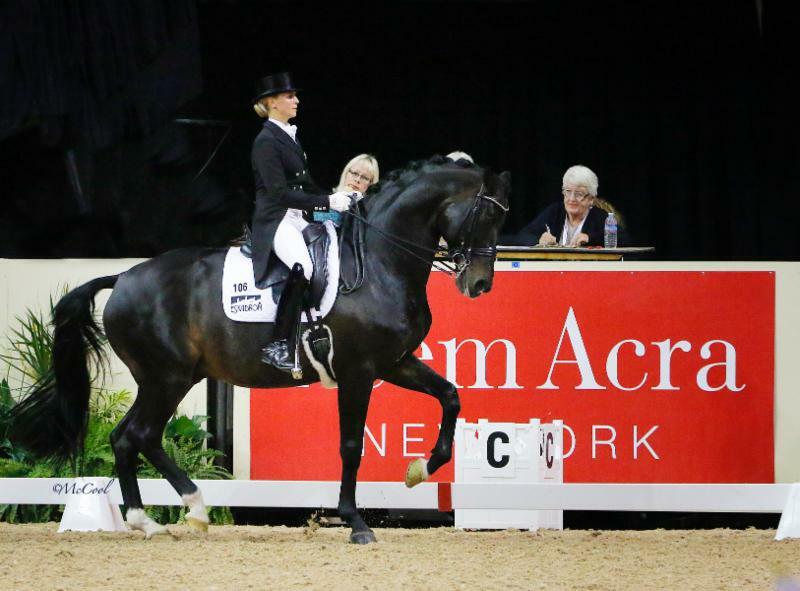 Last to go in the competition, Germany’s Jessica von Bredow-Werndl stayed cool under pressure, and produced an expressive test aboard the 14 year-old stallion Unee BB to earn a score of 80.464% and take third place. 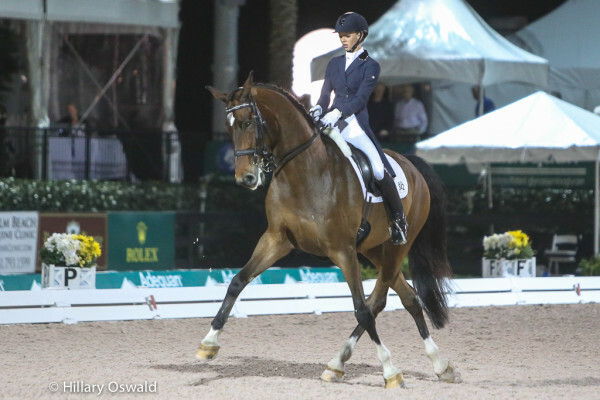 This is the pair’s second trip to the FEI World Cup™ Dressage Finals, having placed seventh at last year’s Finals in Lyon, France. U.S. rider Laura Graves, a 2014 Alltech FEI World Equestrian Games™ veteran, took fourth place in her first-ever FEI World Cup™ Final aboard her own 13 year-old gelding Verdades with a score of 79.125%. 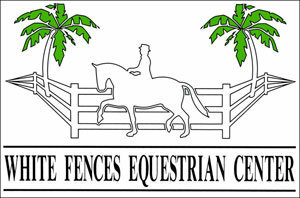 The pair moved up a spot in the final placings as countryman Steffen Peters and Legolas 92 were eliminated due to a small amount of blood found on the horse’s side after the completion of their test, which is a cause for elimination according to FEI rules. In addition to watching the heated competition of the world-renown horses and riders vying for the FEI World Cup™ title, spectators were treated to an amazing opening ceremony, the kind of which can only be found in Las Vegas. Elisa Furr, who is performing as Celine Dion in Legends in Concert at Flamingo Las Vegas, sang the National Anthem. Lexi Walker, just 12 years-old and already a contender on America’s Got Talent, sang the crowd favorite “Let It Go” from the Disney movie “Frozen” while two female aerial acrobats performed on silk ropes. Next up was a superb pyrotechnics and laser light show set to Bruno Mars’s top hit ‘Uptown Funk.’ Viva Las Vegas! The LONGINES FEI World CupTM Jumping Final continues with Sunday afternoon’s two-round Final, as well as Saturday evening’s $75,000 Canadian Pacific Grand Prix of Las Vegas.